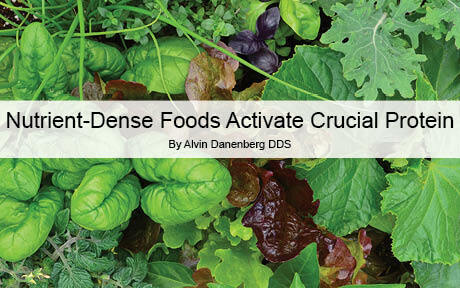 By Alvin Danenberg DDS, Well Being Journal, Vol. 24, No. 4. Nrf2 is not just a few random letters with a number attached. Nrf2 actually means something—something important. For those inquisitive minds that like scientific names, Nrf2 stands for nuclear factor erythroid 2-related factor 2. Actually, Nrf2 is critical for your health. I will describe what this strange “word” is and how it becomes a powerhouse for your body. Nrf2 is a protein—but a very specific protein called a transcription factor. As a transcription factor, it lives in the cytoplasm of the human cell, and it is ultimately responsible for sending genetic information from the DNA located in the nucleus of the cell to the RNA, which then creates chemicals that help cells perform many health-promoting functions. The DNA is the unique biological formula for each of us. Every cell in our body (except red blood cells) contains in its nucleus this architectural script for the entire body. There are approximately 25,000 genes in the human DNA. Nrf2 assists more than 500 of those genes to function in ways that increase antioxidant activities, produce anti-inflammatory effects, stimulate mitochondrial biogenesis, improve mitochondrial function, trigger death of damaged cells, and remove toxic material. Recently, a great deal of research has uncovered Nrf2’s ability to facilitate detoxification and excretion of both organic pollutants and toxic metals. This is critical in light of our repeated exposures to these toxins. However, much of what Nrf2 does and how it works are still being discovered. Once activation has occurred, Nrf2 has been shown to prevent and treat a large number of chronic inflammatory conditions, including various cardiovascular, kidney, lung, and liver diseases; cancer (prevention only); diabetes, metabolic syndrome, and obesity; sepsis; autoimmune conditions; inflammatory bowel disease; HIV/AIDS; and epilepsy. Martin L. Pall and Stephen Levine, in a paper titled “Nrf2, a master regulator of detoxification and also antioxidant, anti-inflammatory and other cytoprotective mechanisms, is raised by health promoting factors,” published in Acta Physiologica Sinica, February 25, 2015, review the recent research surrounding Nrf2. They looked at 141 peer-reviewed studies. The entire article is well worth reading. In their summary, they make the following statement, “We may be on the verge of a new literature on health effects of Nrf2 which may well become the most extraordinary therapeutic and most extraordinary preventive breakthrough in the history of medicine.” ? This article is adapted for Well Being Journal and the full version was published in Vol. 24, No. 4, July/August 2015. It is available in the print or digital edition. Alvin Danenberg, DDS, has been practicing periodontics since 1974 with an emphasis on saving teeth and creating a healthy mouth. In 2010, he began to use the Laser Assisted New Attachment Procedure (LANAP) as a primary treatment for periodontal disease because it eliminates the need for scalpels or sutures. In 2013, he incorporated evidence-based research on ancestral nutrition and healthy gut bacteria into treatment plans for all his patients, and in 2014, he earned the designation of Certified Functional Medicine Practitioner. More at http://drdanenberg.com.